In this article, the use and consolidation of legal vocabulary is investigated in two Swedish legal handbooks from the 17th century written by Clas Rålamb and Claudius Kloot respectively. Both handbooks were written in Swedish but include elements in Latin. Sections of the handbooks that deal with civil cases were analyzed from a lexicological starting point. The 106 legal concepts (LC) and 169 lexical units (LU) identified are sorted into four central semantic areas of the legal process: ACTIONS, ARENAS, PARTICIPANTS and TOOLS. Kloot uses more LCs and more LUs than Rålamb who, on the other hand, shows greater lexical differentiation than Kloot. Rålamb is also shown to use a greater number of Latin LUs than Kloot. The area of TOOLS has the closest connection to Latin. Both authors make use of Latin LUs that are still part of Swedish legal vocabulary. Kloot has a stronger tendency to use Swedish LUs when possible, while Rålamb more freely combines Swedish and Latin LUs. Rålamb’s and Kloot’s use of Latin and Swedish LUs is discussed as well as their policies regarding the use of Latin and Swedish. Finally, the lexication of Latin and Swedish LUs in the legal domain in Swedish is discussed. Landqvist, Hans, und Lena Rogström. 2018. Introducing a Local Legal Vocabulary in a Latin Context. 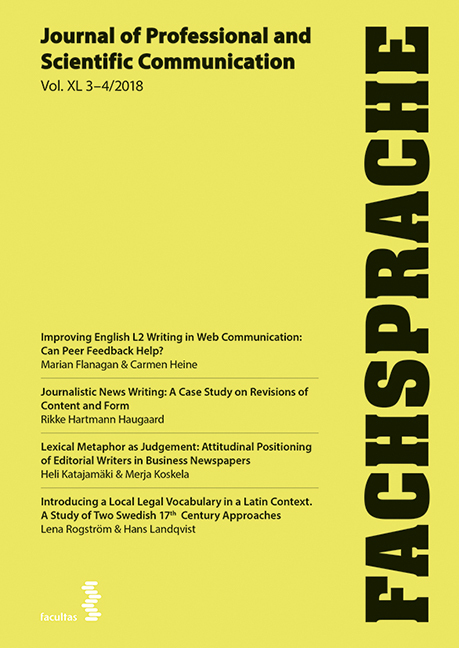 Fachsprache 40 (3-4), 162-79. https://doi.org/10.24989/fs.v50i3-4.1500.